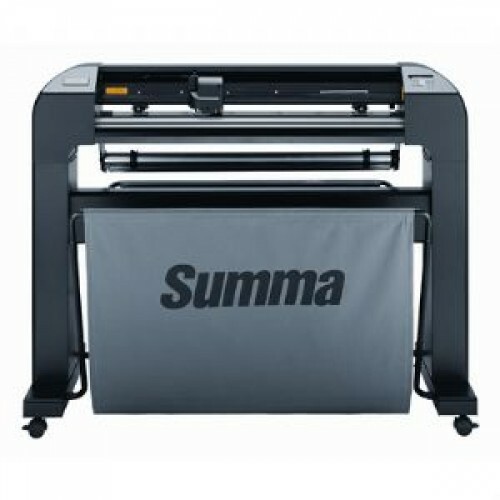 Summa have developed the S Class 2 vinyl cutter to fulfill the needs of every sign maker with emphasis on the functions and performance needed in high volume vinyl and digital print shop environments. When tight deadlines loom and jobs require hassle-free perfect cuts the S2 truly shines. This drag knife driven cutter has a host updated features from the previous model including an enhanced colour LCD touchscreen additional network connectivity and improved processing speed. Tangential cutting technology guarantees a superior performance compared to commonly used swivel knife techniques. The direction of the tangential knife is electronically controlled, by which T series are capable of cutting very precisely and with very high pressures. The perfect cutting makes weeding very easy, saving you a lot of valuable time. The patented nose piece avoids small pieces being pushed out of the vinyl while cutting. With up to 600 grams of cutting force, Summa S Class powers through heavy sandblast, paint mask and reflective materials with incredible ease, speed and accuracy. With a T model, you know you can do the job!